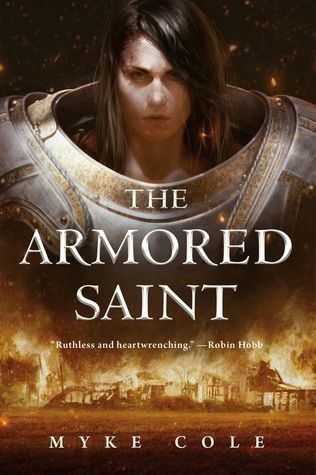 First things first: I want to thank Tor Publishing for providing an ARC of The Armored Saint for review on my blog (FanFiAddict.Wordpress.com). Second, I want to thank Myke Cole for writing such an emotionally charged, ruthless novella that left me wanting more. The Armored Saint is classified as a novella, though at around 60,000 words (approx 200 pages), it needs to be taken as a short novel. It can be read in a matter of hours, depending on your reading speed and time allowance; and honestly, this is one that needs to be devoured in 1-2 sittings. From the very beginning, you will become enamored with Heloise and her village’s struggle with The Order. The Order is a group of religious tyrants who look to uphold the sacred word of The Writ, meaning they are to rid the world of wizards that are believed to have the ability to summon demons from hell through portals in their eyes. Heloise, in her sixteen year old naivety, stokes the fire/stirs the pot with a group of these fanatics and puts her family in grave danger. Low and behold, The Order is just the least of their worries. The Armored Saint is character driven story. It is about love, loss, and searching through your feelings to find your true self. It is about bravery overcoming fear and growing into adulthood before you are truly ready. You will come to love Heloise and all that she stands for; and yes, you’ll even agree with the litany of dumb decisions she makes. Cole has built a world here that I want to be able to explore more of, as we are only given a tiny glimpse into its vast expanse, but what he has provided is like that first tiny bite into your favorite dessert – just a taste. I also expect he will divulge more information on the hierarchy of The Order and its creation, or at least why The Order believes itself to be the last hope. The Armored Saint is just the first in a trilogy of short novels and I cannot wait to see what The Queen of Crows gives us come Oct. 2018. I cannot recommend it enough, so make sure you pre-order and mark February 20th on your calendars!